TechSpot: An Easy Way to Add Google Analytics Code to your Blogger Blog Template. An Easy Way to Add Google Analytics Code to your Blogger Blog Template. Google analytics is a useful and handy tool to analyze the performance of your blog. As it is a free too, and provided by trusted agent, Google, most people prefer to add it in their blog. Here is a quick explanation on how to add Google analytics in your blogger blog. Assuming that you have already sing in to Google analytics and created your blog’s profile, Now copy the tracking code available there. 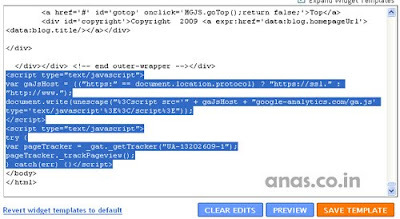 Now copy the Google analytics tracker code just between and tag, as you see in below picture. Now, save your template. And make some ‘visit’ to your blog. Go back to Google analytics Dashboard page, and look at the status. You will see a green tick mark that means your tracking code implementation is successful. But, if your status is showing a yellow exclamation that means either you have to wait sometime or you’re tracking code is not implemented properly. Remember it will take up to 24 hours to update Google analytics page for the first time; for instance, it took around 8 hours in case of my blog. If you find it is not working despite long hours wait, please re generate and add the tracker code again.